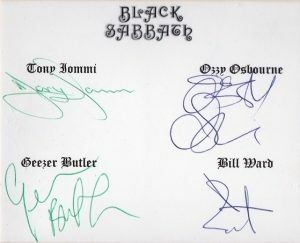 Black Sabbath Autographs and Autograph examples, Ozzy Osbourne, Tony Iommi, Geezer Butler and Bill Ward. Heaven and Hell with Ronnie James Dio. Sabbath were an English rock band, formed in Birmingham in 1968, by guitarist and main songwriter Tony Iommi, bassist and main lyricist Geezer Butler, drummer Bill Ward, and singer Ozzy Osbourne. Black Sabbath is often cited as pioneers of heavy metal music. The band helped define the genre with releases such as Black Sabbath (1970), Paranoid (1970), and Master of Reality (1971). 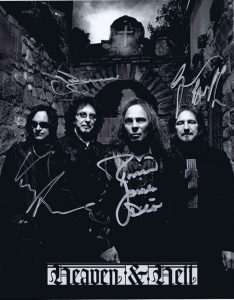 The band had multiple line-up changes, with Iommi being the only constant member throughout its history. Formed in 1968 as the Polka Tulk Blues Band, a blues-rock band, the group went through line up changes, renamed themselves as Earth, broke up and reformed. 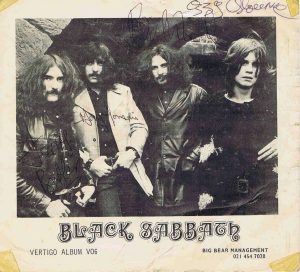 By 1969, they had named themselves Black Sabbath autographs after the film Black Sabbath starring Boris Karloff and began incorporating occult themes with horror-inspired lyrics and tuned-down guitars. The band’s first show as Black Sabbath took place on 30 August 1969, in Workington. Their debut album, Black Sabbath, was released on Friday the 13th, February 1970, on Philips’ newly formed progressive rock label, Vertigo Records. Though receiving a negative critical response, the album was a commercial success and reached number 8 in the UK Albums Chart, so the band returned to the studios to quickly record the follow-up, Paranoid, which was also released in 1970. The band’s popularity grew, and by 1973’s Sabbath Bloody Sabbath, critics were starting to respond favourably. Furthermore, Osbourne’s regular use of alcohol and other drugs led to his dismissal from the band in 1979. Replaced by former Rainbow vocalist Ronnie James Dio. 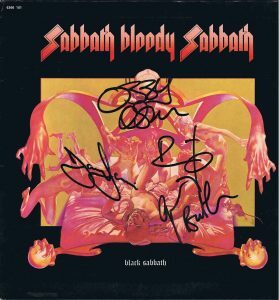 Following two albums with Dio; Black Sabbath Autographs endured many personnel changes in the 1980s and 1990s that included vocalists Ian Gillan; Glenn Hughes, Ray Gillen and Tony Martin, as well as several drummers and bassists. In 1991, Iommi and Butler rejoined Dio and drummer Vinny Appice to record Dehumanizer (1992). Additionally, the original line-up reunited with Osbourne in 1997 and released a live album Reunion. 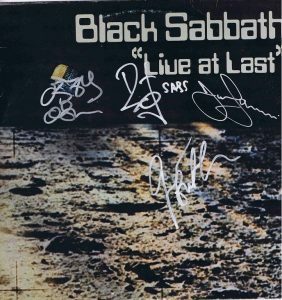 Black Sabbath’s final studio album and nineteenth overall, 13 (2013); features all of the original members but Ward; who left the band prior to the recording sessions due to a contract dispute. A year after embarking on a farewell tour, the band played their final concert in their home city of Birmingham on 4 February 2017, after which they broke up. Iommi has stated that he has not ruled out the possibility of new material or one-off shows under the Black Sabbath name.